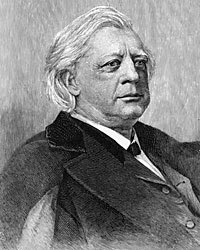 Henry Ward Beecher was “the most accomplished artist of them all if stump oratory was required from the pulpit,” wrote Lincoln biographer Carl Sandburg.4 He was a prolific speaker and those speeches became the basis for published works. Among Beechers’ books were Lectures to Young Men and the Plymouth Collection of Hymns, Norwood, a Novel of New England Life, and Star Papers. 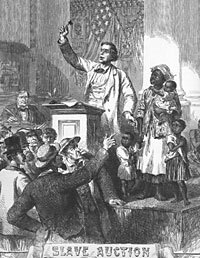 Rhetorical expert Halford R. Ryan called Beecher “the North’s vox populi on slavery.”5 That was particularly the case when Beecher lectured in England in 1863 on behalf of the North’s cause. “It was Mr. Beecher’s genius to create that public sentiment which underlies and gives force to political action in a democracy, and to give effective and eloquent expression to that sentiment when it had been created. To this work he gave himself with singleness of purpose, for he understood the mission to which he had been called better than any of his critics, better than some of his eulogists,” wrote Beecher biographer Lyman Abbott.7 Shortly before Mr. Lincoln visited Plymouth Church in February 1860, Beecher conducted one of his most publicized church services — auctioning off a 9-year-old slave girl nicknamed “Pinky,” who had been brought from Virginia to Brooklyn specifically so she could be sold off into freedom. Not only did Beecher raise the required $900 for freedom, but also an additional $1100 for the education of the girl, whose real name was Rose Ward Hart. In 1864, Beecher observed of Mr. Lincoln in The Independent : “It would be difficult for a man to be born lower than he was. He is an unshapely man. He is a man that bears evidence of not having been educated in schools or in circles of refinement.”27 The weekly Independent had been purchased by a parishioner, Henry C. Bowen in 1860. Beecher had become editor, but most of the publication’s editorial work was done by his assistant, Theodore Tilton. 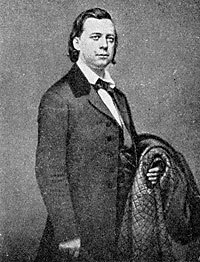 According to Andrew A. Freeman, “During the Civil War, there were rumors that Lincoln, when in a melancholy mood, would come to New York and at night surreptitiously slip over to Plymouth Church to receive the ministrations of Henry Ward Beecher. Of the origin of that myth, Sinclair Lewis wrote: ‘Beecher confided to many visitors that he was always glad to pray with Lincoln and to give him advice whenever the President sneaked over to Brooklyn in the ark. '”28 William J. Wolf reported in his study of Mr. Lincoln’s religious practices: “According to a grandson of Henry Ward Beecher who claimed to have heard it from Mrs. Beecher ‘in her old age,’ Lincoln after the disaster of Bull Run appeared at their Brooklyn door with his face hidden in a military cloak. Without giving his name he asked to see the famous preacher. The anxious Mrs. Beecher at her husband’s bidding admitted the suspicious character. Behind closed doors she heard their voices and the pacing of their feet until the mysterious visitor left about midnight. Shortly before Beecher’s death he is supposed to have revealed that his caller was Lincoln in disguise. First. According to the statement the story was never told by Mr. Beecher until more than twenty years had elapsed, this secrecy was incompatible with Mr. Beecher’s temperament. Second. That not knowing whether the muffled visitor was ‘a lunatic, an acquaintance, a friend or a foe,’ the fact that it was alleged that Mr. Beecher asked that the stranger be ‘shown up’ militated against its acceptance…. I will not dwell upon the moral power stored in the names of those young heroes that have fallen in this struggle. I cannot think of it but my eyes run over. They were dear to me, many of them, as if they had carried in their veins my own blood. How many families do I know, in which once was the voice of gladness, in which now father and mother sit childless! How many heirs of wealth, how many noble scions of old families, well cultured, the heirs to every apparent prosperity in time to come, flung themselves into their country’s cause, and died bravely fighting for it. And every such name has become a name of power, and whoever hears it hereafter shall feel a thrill in his heart — self—devotion, heroic patriotism, love of his kind, love of liberty, love of God. I cannot stop to speak of these things; I will turn myself from the past of England and of America to the future. It is not a cunningly—devised trick of oratory that has led me to pray God and His people that the future of England and America shall be an undivided future and a cordially united one. I know my friend Punch thinks I have been serving out ‘soothing syrup’ to the British Lion. Very properly the picture represents me as putting a spoon into the lion’s ear instead of his mouth; and I don’t wonder that the great brute turns away so sternly from the plan of feeding. If it be an offence to have sought to enter your mind by your nobler sentiments and nobler faculties, then I am guilty. I have sought to appeal to your reason and to your moral convictions. 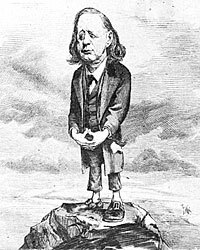 Beecher’s British speeches had a profound impact. “These speeches of Mr. Beecher’s, a stranger in a strange country, to hostile audiences, were probably as extraordinary an evidence of oratorical power as was ever known. He captured audiences, he overcame the hostility of persistent disturbers of the meetings, and with his ready wit overwhelmed the heckler.” wrote friend Chauncey M. Depew.42 Lincoln biographer Emmanuel Hertz wrote that “after reading those speeches, five of them which Beecher delivered in England, [President Lincoln ] said to his Cabinet toward the end that if war was ever fought to a successful issue there would be but one man — Beecher — to raise the flag at Fort Sumter, for without Beecher in England there might have been no flag to raise.”43 And raise the flag Beecher eventually did on the day President Lincoln was assassinated. Mr. Lincoln responded to Beecher’s plea and asked Secretary of War Edwin M. Stanton to order his release. Mr. Lincoln inquired of Secretary of War Edwin M. Stanton: “I very much wish to oblige Henry Ward Beecher, by releasing Howard; but I wish you to be satisfied when it is done. What say you?”50 To Mr. Lincoln’s inquiry, Stanton required, “I have no objection if you think it right and this a proper time.”51 Rev. Beecher wavered in his support of President Lincoln, but by the end of September 1864, according to historian Burton J. Hendrick, Beecher “waxed as fervent in praise as he had previously wailed in detraction.”52 Perhaps ironically, the day that President Lincoln authorized Howard’s release was also the day he apparently came to the conclusion that he would not be reelected; Mr. Lincoln had his Cabinet place their signatures on a memo pledging to finish the war before a new Administration took over. This allusion to the ‘little bell,’ though not understood possibly now, was broad and pointed then, when the whim, caprice or necessity as the case might be, of a moment sent men, singly or in squads, as prisoners to the nation’s Bastiles upon the tinkle, as it were, of an official bell. The interview and information which you gave me, not only relieved me then, but has, ever since, given me great faith. Even your unexpected visit to Ft Munroe, did not stagger me. It has been much criticised. The pride of the nation, is liable to be hurt. Anything that looks like the humiliation of our Government, would be bitterly felt. And I clearly perceive, that, whether you gained any point with the South or not, by going the very Extraordinary step, of the Head of a Nation, leaving the Capital, and going to the rebels, is an act of Condescension which will stop the mouths of northern Enemies. No man on Earth, was Ever before so impregnably placed, as you are. Look at the facts. 1. The South is exhausted are and defeated. The military result is sure. 3. You have brought the most dangerous and Extraordinary rebellion in history, not only to a successful End, but, have done it without sacrificing republican Gover[n]ment Even in its forms. It is wonderful, and a sign of Divine help, that democratic institutions & feelings, are stronger today, — after four years of War, and military administration not less as Enlarged than as when all Europe was one Camp, — than when you began. The north is renovated, Heresy is purged out, Treason is wounded to the death. The Constitution has felt the hand of God laid upon it, as He said, “Be thee clean” & the leprosy is departed[.] You have now done all that your Enemies, Even, could ask to shew your desire for peace, & more than many of your friends could wish.— Your position is Eminent & impregnable. I am only anxious that you should not lose that place. I do not believe that you will. But it is more dangerous to make peace than to make War. Why then do I write to you? 1. Because, it seemed to me, that a man in public office, seeing chiefly political & official people, might be cheered to hear from a private citizen, seeking no office, and having no political ends, except such as all good Citizens have. 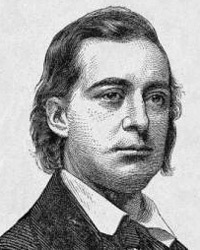 Family biographer Lyman Beecher Stowe wrote: “During the closing weeks of the war, Secretary Stanton wired Beecher after every important development. On Sunday morning, April 2, 1865, in Plymouth Church, just after the sermon, a telegram from Secretary Stanton was handed to Beecher in the pulpit announcing decisive Union victories after three days of hard fighting. After reading it aloud Beecher asked the thousands present to turn to America. [in their hymn books]. The great company, realizing that the war was practically over, sang the noble anthem with stream eyes.”62 A few days later, Rev. 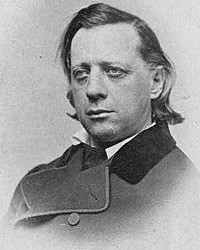 Beecher sailed for Charleston, South Carolina with General Robert Anderson, the Army officer who had commanded Fort Sumter before its surrender on April 14, 1861. On April 14, 1865, the day President Lincoln was assassinated, Beecher and Anderson were in Charleston to commemorate the war’s beginning and end. And now the martyr is moving in triumphal march, mightier than when alive. The nation rises up at every stage at his coming. Cities and states are his pall—bearers, and the cannon speaks the hours with solemn progress. Dead, dead, dead, he yet speaketh. Is Washington dead? Is Hampden dead? Is any man that was ever fit to live dead? Disenthralled of flesh, risen to the unobstructed sphere where passion never comes, he begins his illimitable work. His life is now grafted upon the infinite, and will be fruitful as no earthly life can be. Pass on, thou that has overcome! Your sorrows, oh people are his peace! Yours bells, and bands, and muffled drums, sound triumph in his ear. Wail and weep here; God makes it echo joy and triumph there. Pass on! 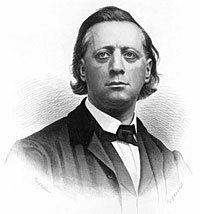 Beecher gave up his Independent editorship in 1864 and subsequently became the editor of The Christian Union. 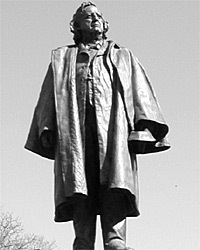 His reputation in later years was marred by his support for President Andrew Johnson, his retreat on the rights of freed slaves, and a scandal initiated by Theodore Tilton, a parishioner who succeeded Beecher as editor of the Independent. Tilton went off on his own journalistically — and off the deep end editorially and personally. “Beecher’s famous trial on charges made by Theodore Tilton against him on relations with Tilton’s wife engrossed the attention of the world. The charge was a shock to the religious and moral sense of countless millions of people. 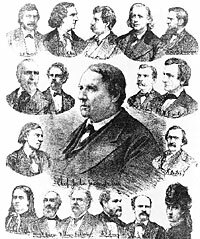 When the trial was over the public was practically convinced of Mr. Beecher’s innocence,” later wrote Republican attorney Chauncey M. Depew.68 Depew’s friendship perhaps skewed his judgment of the 1875 trial. 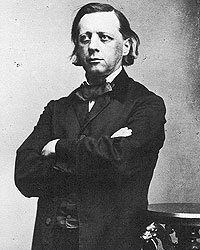 Beecher biographer Paxton Hibben concluded that the “If a jury of his neighbors could not agree that Henry Ward Beecher was not an adulterer, the rest of the country may be forgiven for not being quite certain about it, either.”69 Public faith in Beecher, however, had been shattered. His reputation never recovered. Chauncey M. Depew, My Memories of Eighty Years, p. 324. Joseph R. Howard, Life of Henry Ward Beecher: The Eminent Pulpit and Platform Orator, p. 463. Joseph R. Howard, Life of Henry Ward Beecher: The Eminent Pulpit and Platform Orator, p. 92. Carl Sandburg, Abraham Lincoln: The War Years, Volume IV, p. 364. Halford Ross Ryan, Henry Ward Beecher: Peripatetic Preacher, p. 44. Lyman Beecher Stowe, Saints Sinners and Beechers, p. 278. Lyman Abbott, Henry Ward Beecher, p. 229. Francis B. Carpenter, The Inner Life of Abraham Lincoln: Six Months at the White House, p. 135. Thomas Graham Belden and Marva Robins Belden, So Fell the Angels, p. 217. David B. Chesebrough, No Sorrow Like Our Sorrow: Northern Protestant Ministers and the Assassination of Lincoln, p. xi. Chauncey M. Depew, My Memories of Eighty Years, p. 327-328. 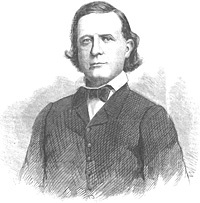 Joseph R. Howard, Life of Henry Ward Beecher: The Eminent Pulpit and Platform Orator, 134, . Joseph R. Howard, Life of Henry Ward Beecher: The Eminent Pulpit and Platform Orator, p. 270. Lyman Beecher Stowe, Saints Sinners and Beechers, p. 285. Lyman Abbott, Henry Ward Beecher, p. 228-229. Halford Ross Ryan, Henry Ward Beecher: Peripatetic Preacher, p. 38-39. Allan Nevins, The War for the Union: War Becomes Revolution, 1862-1863, p. 301. Lyman Beecher Stowe, Saints Sinners and Beechers, p. 286. Carl Sandburg, Abraham Lincoln: The War Years, Volume II, p. 578. Allan Nevins, editor, Diary of the Civil War, 1860-1865: George Templeton Strong, p. 373 (November 26, 1863). Paxton Hibben, Henry Ward Beecher: An American Portrait, p. 159. Paxton Hibben, Henry Ward Beecher: An American Portrait, p. 129. Allen Thorndike Rice, editor, Reminiscences of Abraham Lincoln by Distinguished Men of His Time, p. 249 (Henry Ward Beecher). Paxton Hibben, Henry Ward Beecher: An American Portrait, p. 184. Andrew A. Freeman, Abraham Lincoln Goes to New York, p. 149. William J. Wolf, The Almost Chosen People: A Study of the Religion of Abraham Lincoln, p. 26-27. Lyman Beecher Stowe, Saints Sinners and Beechers, p. 287. John W. Starr, Jr., “Did Lincoln and Beecher Pray Together?”, p. 1-2 (Reprinted from Christian Advocate, April 22, 1926). Emmanuel Hertz, Abraham Lincoln: A New Portrait, p. 105. William J. Wolf, The Almost Chosen People: A Study of the Religion of Abraham Lincoln, p. 27. Allen Thorndike Rice, editor, Reminiscences of Abraham Lincoln by Distinguished Men of His Time, p. 247 (Henry Ward Beecher). Halford Ross Ryan, Henry Ward Beecher: Peripatetic Preacher, p. 36. Lyman Abbott, Henry Ward Beecher, p. 262. Daniel Van Pelt, Leslie’s History of the Greater New York, Volume I, p. 412. Lyman Beecher Stowe, Saints Sinners and Beechers, p. 289-290. Allan Nevins, The War for the Union: War Becomes Revolution, 1862-1863, 1862-1863, p. 303. Joseph R. Howard, Life of Henry Ward Beecher: The Eminent Pulpit and Platform Orator, p. 343-345. Chauncey M. Depew, My Memories of Eighty Years, p. 324-325. Emmanuel Hertz, Abraham Lincoln: A New Portrait, p. 106. Joseph R. Howard, Life of Henry Ward Beecher: The Eminent Pulpit and Platform Orator, p. 384. Robert S. Harper, Lincoln and the Press, p. 296. William E. Barton, The Life of Abraham Lincoln, Volume II, p. 287. Abraham Lincoln Papers at the Library of Congress. Transcribed and Annotated by the Lincoln Studies Center, Knox College. Galesburg, Illinois. (Letter from Henry Ward Beecher to John D. Defrees1, August 2, 1864). Roy P. Basler, editor, The Collected Works of Abraham Lincoln, Volume VII, p. 512 (Letter to Edwin M. Stanton, August 22, 1864). Roy P. Basler, editor, The Collected Works of Abraham Lincoln, Volume VII, p. 513 (Letter to Edwin M. Stanton, August 22, 1864). Burton J. Hendrick, Lincoln’s War Cabinet, p. 456. Don C. Seitz, Lincoln the Politician, p. 433. Paxton Hibben, Henry Ward Beecher: An American Portrait, p. 168-169. Joseph R. Howard, Life of Henry Ward Beecher: The Eminent Pulpit and Platform Orator, p. 351. Sidney David Brummer, Political History of New York State During the Period of the Civil War, p. 428 (New York Tribune, October 25, 1861). Allen Thorndike Rice, editor, Reminiscences of Abraham Lincoln by Distinguished Men of His Time, p. 249-250 (Henry Ward Beecher). Lyman Beecher Stowe, Saints Sinners and Beechers, p. 294-295. Abraham Lincoln Papers at the Library of Congress. Transcribed and Annotated by the Lincoln Studies Center, Knox College. Galesburg, Illinois. (Letter from Henry Ward Beecher to Abraham Lincoln, February 4, 1865). Paxton Hibben, Henry Ward Beecher: An American Portrait, p. 169. Abraham Lincoln Papers at the Library of Congress. Transcribed and Annotated by the Lincoln Studies Center, Knox College. Galesburg, Illinois. (Letter from Abraham Lincoln to Henry Ward Beecher [Copy], February 27, 1865). Lyman Beecher Stowe, Saints Sinners and Beechers, p. 295. Halford Ross Ryan, Henry Ward Beecher: Peripatetic Preacher, p. 43. William E. Barton, The Life of Abraham Lincoln, Volume II, p. 359. Allen Thorndike Rice, editor, Reminiscences of Abraham Lincoln by Distinguished Men of His Time, p. 247-248 (Henry Ward Beecher). Joseph R. Howard, Life of Henry Ward Beecher: The Eminent Pulpit and Platform Orator, p. 444. Chauncey M. Depew, My Memories of Eighty Years, p. 326. 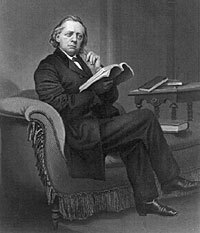 Paxton Hibben, Henry Ward Beecher: An American Portrait, .